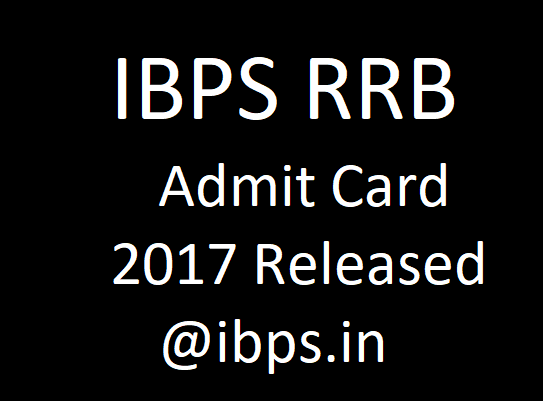 IBPS RRB Admit Card 2017 pre-exam is released for the Officer Scale I and Office Assistant Multipurpose. Candidates can download the IBPS RRB CRP VI Call letter in between 21.08.2017 to 03.09.2017. Aspirants who had engaged in the online registration process are looking for IBPS Admit Card. Right now, all the candidates can download the hall ticket from the official website ibps.in. The Prelims written examination in scheduled on 09.09.2017, 10.09.2017 and 16.09.2017 for Officer Scale-I and 17.09.2017, 23.09.2017 and 24.09.2017 for office assistant post. The direct link of call letter is available in this page below. Institute of Banking Personnel Selection (IBPS) main aim is to encourage the placement of young graduates in public sector banks in India. IBPS started its works in the year 1975. It conducts the Common Recruitment Process- IBPS RRB Phase VI examination 2017; the interested and eligible candidates had submitted their application. All the aspirants can download the IBPS RRB Admit Card 2017 by entering their essential details in the official site. IBPS RRB CRP VI Call letter is mandatory for the examination, we advice candidates to not to forget the admit card to the exam hall. The qualified candidates in the prelims written examination are eligible to enter into the main examination which is going to held on 5th and 12th November 2017. The competition for this examination is very high, so aspirants should prepare well for the examination and download the IBPS RRB Admit Card 2017 in time. Only 15338 posts are available. Refer our site for every update regarding IBPS exams and Bank exams. We will update the IBPS RRB Prelims result and Mains results in our site.